Explore Jordan Blog: Wilderness First Aid - Hike Safe! Wilderness First Aid - Hike Safe! In outdoors you should always be ready for the unexpected. In an extreme environment with many parameters out of control, accidents may happen. And then you will need to be prepared as a trip leader to provide the help and care for people who become ill or injured far from definitive medical care, and only using the limited resources Available. The minute the guide accepts a participant to be in his group, he takes all the responsibility for bringing him back safe. In general, few simple acts of first Aid can make a difference between life and death, the lack of understanding these acts can put everyone in the outdoor group in danger. For this, and for our believe in the importance of understanding the First Aid acts in a remote area, and its importance to save lives and keep our participants safe, in Explore Jordan we keep following up and training our guides to be ready for helping in any case of any help been needed, not only for our participants but also for any other outdoor enthusiast. For that we have the following number will be accessible, please don’t hesitate to call us if our knowledge can be of a use for you, or if help is needed. SOLO Wilderness Medicine, USA. (WFA). 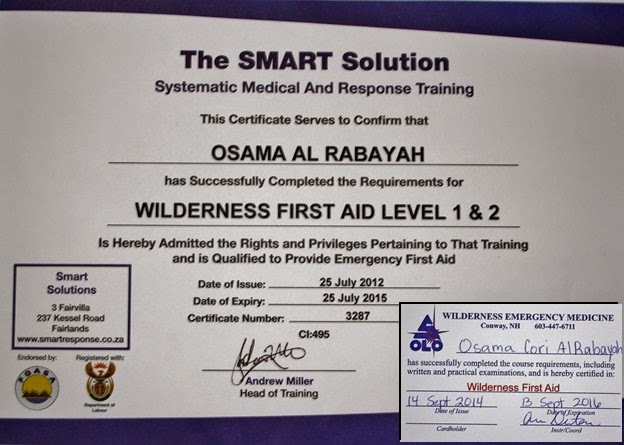 SMART Wilderness First Aid Level (1, 2), South Africa. SOLO and Smart First Aid Certificates.